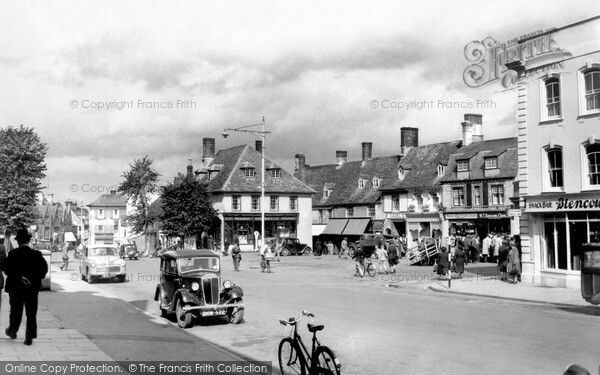 Cadel Shop Market Square - a Memory of Witney. The shop in the middle of the picture with the two awnings (now the Nationwide building society) used to belong to my great grandmother Eva Cadel and was a wool and toy shop. My Grandmother and Great Aunt ran it until 1971. My grandmother Joan ran the toy side and my Great Aunt Mary ran the wool. Many people still today tell me that their first pram/doll/train set came from the Cadel shop. Pictures such as these are very special and are a treasure. A memory shared by Nicola Best on Dec 26th, 2006. Send Nicola Best a message. Add a memory of Witney.